Fanatics Search is a potentially unwanted program. It means that this application is not a malicious computer infection, but it would not be a good idea to keep it on your system. What’s more, if you do not remember adding this extension to your browser, it could be a sign that you have several other unwanted applications on your computer, and you have to remove them all. For now, let’s focus on removing Fanatics Search from your browser. After that, you can get yourself a computer security tool that will locate other unwanted applications, and you will be able to terminate them for good. 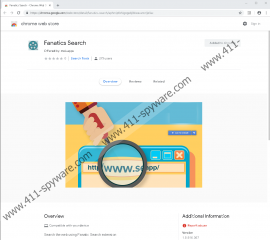 Fanatics Search functions as a browser extension, and it is compatible with Firefox and Chrome. You can also find it at the Firefox’s Add-on page and the Chrome Web Store. From this, we could assume that this extension should be distributed legally and that it is not a computer security threat. Nevertheless, computer users might add this extension to their browser accidentally without even realizing that they are doing it. How does that happen? Well, clearly Fanatics Search has more than one way to reach your browser. According to our research team, this extension often comes from redirects and pop-up ads. Now, what do they mean by that? There are a lot of websites out there that support third-party advertising, and a pop-up advertisement might jump into your screen the moment you click something on that page. In some cases, the Fanatics Search extension might be added to your browser automatically the moment this ad pops up. Sometimes, it will also display a pop-up menu that asks you to add the extension in order to close the pop-up window. More often than not, users click the Add button without reading everything through and through. So in a sense, Fanatics Search does not enter your computer surreptitiously. It needs your permission to be added to your browser. But once it gets added, it changes your default search engine, and all your web search queries are monitored by a third party. Of course, Fanatics Search cannot collect personally identifiable information, so there is no need to worry about that. 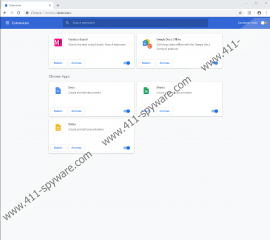 However, the fact that this program monitors your online browsing means that it can expose you to third-party advertising. Some of the ads promoted by Fanatics Search could be customized according to your likes and preferences, thus making you click them. And while such practice is not illegal (and in some cases, it could also be quite convenient for you), it is also possible for cyber criminals to make use of this advertising space to expose you to potentially harmful content. Therefore, it is important that you remove Fanatics Search from your system as soon as possible. While it is not complicated to delete this extension, you should also consider scanning your PC with a security tool because there might be more potentially unwanted programs on your computer, and you have to delete them all. Also, if you have more questions about computer security, you can leave us a comment below. Press Alt+T and go to Add-ons. Delete the app from the list. Press Alt+F and select More tools. Remove the application from the list.